The city of Santa Fe is full of hidden gems that can fill in the gaps between seeing the major attractions around the city. Most of these little-known wonders and bits of history lie around the Santa Fe Plaza in the heart of town, but there is one artistic find on the outskirts of the city. The Haiku Pathway sits in the center of the unassuming Santa Fe Community College Campus but is an excellent way to escape any crowds in areas with heavy tourist traffic. Do you need some help planning your trip to Santa Fe? Well, our Vacation Guide has all of the local tips and insider information you need! All you have you to do is choose what you want to do! It’s as easy as 1,2,3. Haiku Pathway winds through a quiet courtyard in the center of Santa Fe Community College, which is less than a 20-minute drive from Four Kachinas Inn. Thirty-six stones dot the area under several shady trees, each with a Haiku written by former students, famous New Mexican poets, and Miriam Sagan, the project’s poetry curator. As you take a relaxing walk around the garden, you can take in these stones filled with descriptions of the New Mexico’s landscapes, humor, reflection, and whimsy. While this may not be a groundbreaking discovery, it’s a Santa Fe secret that is true to the city. If you’re looking for other hidden gems around town, check out our blog that highlights six other little-known sights worth exploring! Tip: Santa Fe College is open every day but Sunday, although the courtyard is always open to the public. If you enjoyed the artistic genius of the Haiku Pathway, you’ll love the museum highlighting New Mexico’s most well-known artist! The Georgia O’Keeffe Museum features over 700 of her drawings and photographs, personal archives, and possessions in nine different gallery exhibits. This interesting museum showcases an array of beadwork, crafting, and other forms of unique cultural artwork from around the world. The Museum of International Folk Art provides keen insight into the artistic aspects of various cultures with a cycle of exhibits that rotate on a yearly basis. Events and tours hosted by the museum add to the immersive experience. The New Mexico Museum of Art sits just two blocks away from the Georgia O’Keeffe Museum on the corner of Santa Fe Plaza. This is a great place to escape the heat and the crowds of the plaza area to explore a mix of sculptures, paintings, and other forms of art that celebrate the Land of Enchantment’s Southwestern heritage and natural beauty! 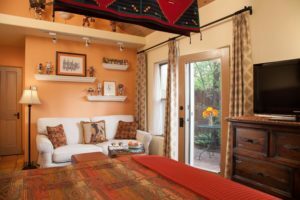 After you finish exploring the Haiku Pathway and Santa Fe’s other artistic gems, venture back to your relaxing room at Four Kachinas Inn. We are only a 10-minute walk from Santa Fe Plaza and all of the fantastic historical sights and museums surrounding it, making it easy for you to get around without a car! Our rooms feature authentic Southwestern decor and accents with a comfortable and modern touch. After a great night sleep, you will wake up to a delicious gourmet breakfast that will fuel you up for a day of exploring the City Different! Stay with us at Four Kachinas for a truly unique stay that is unparalleled in our amazing city! Check our room availability and start planning your trip today! We hope to see you soon!